It's September already soon! It's spring time in the Down South. Crazy how fast time flies, right? I'm nearly there to complete my Bachelor studies and really really soon from leaving Melbourne (temporary) for a new venture in Japan next year. I decided to take an internship in Tokyo for 6 months and everything is already on set! Except my visa, which I hope won't be such a pain. So with 4 months left, let's make the times in Melbourne count! I found this list exercise in Pip's blog. I think it's such a good idea to scribble things down, especially because I have such an impulsive and scattered brain, haha. As she said, it's a really simple way to reflect on who you are, what you like, aspirations, etc You may want to give it a try too! 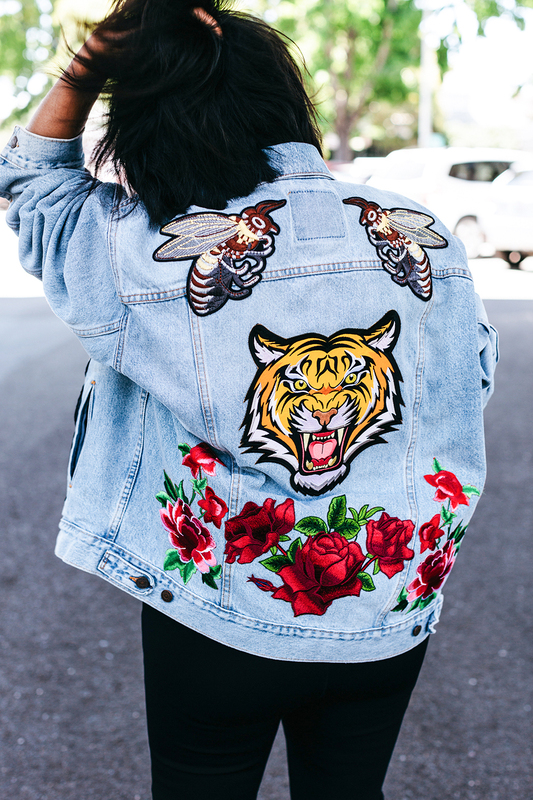 Making : Gucci inspired DIY embroidered jacket. LOVE this. I just get a vintage Levis Jacket so will probably give it a personal touch as well! Coveting: Going home to Indonesia.. If you open my instagram or snapchat lately, you will know that I'm currently kinda crazy about film photography. I've spent days and night googling through articles about film cameras, looking at the film results in tumblr, and stalking people in Australian Film Photographers facebook club for some weeks now. Before you call me obsessed, I have been interested at shooting film for years, but my parents had always turned me down on it. They always look at me in horror each time I'm asking for money to buy $400 20 years old analog camera which I don't even know working or not! So now in 21 years old of age, I am finally, confidently, taking a big big step by getting a Contax T2 (Oh yeah). Probably among you guys, many are interested to start shoot film instead of digital. So I want to share from my personal experiences, how to take your first baby steps on film. Let's roll! 1. Choose the right gear for you. It must be a camera that you know you'll love. You have to have butterflies in your stomach when you look at it, or whatever. There are so many options to choose, yet for a beginner, this can be super intimidating. I think, a classic SLR like Nikon F3, Canon AE-1, Olympus OM-2 or Minolta SRT 101 are great options. They are super easy to use, produce great quality images and they are perfect for learning! So as either one is good, don't contemplate too much!!! Just find one that is working and grab it! Bargain Guide: For Canon AE-1, you can find one in Very Good condition as cheap as 150 AUD, while Nikon F3 body + Nikkor 50mm 1.4 lens can be bought from 230 AUD. That price is quite a bargain tho. It should not cost you more than 400 AUD, except if you are looking to get something in mint or limited edition condition. Finding cheap stuffs is a skill itself, which I will tell you in the following chapters. I joined Australian Film Photographers club several weeks ago and I'm regretting why I didn't find this group earlier. This group ROCKS! The people are always posting their latest film frames that keep me motivated and informed. Many knowledge on good camera, lenses, and types of films can be learned just from stalking this page. Now I know what is the difference of shooting in Kodak Portra, Fujicolor, Agha Vista, etc. Every several days there will be some random strangers selling cheap films, camera, lenses, or asking for barter. It'll definitely cut the cost on your camera gear expenses and find some real bargains. I met the guy who sold me Contax from here, and it's such a bliss! I called out in the group if someone have a mint Contax T2 and this guy appeared. If it wasn't for him, I would spend 50 to 100 more bucks on a camera with worse physical quality than what he sold me. 3. Make a watch list on ebay and watch the price for a week or so. So if you've decided what camera you want to buy, go to ebay and start to look at the available listings. Remember. Always, always buy from seller who offer return options. We don't want any heartbreaks here. Also, always check the details. There's fungus in the lens? Skip. Dust? Red light, but it's okay if it doesn't affect the photo. You can clean it. The level of appearance depends on how much you are willing to spend. If you don't get eye itch by looking at the scratch and wear marks, then go for the cheap one, as long as it is technically working. "You don't buy camera to look at it, but to use it", one camera seller said to me. But still, hold your watch list for a week or so to see how much does people usually spend on that type of the camera. It can help you to judge better and land a bargain. Sometimes you can get a point and shoot camera for as low as 5 AUD. Sick. Film is expensive, so you can't take each click for granted like you always do with your digital camera or smartphone. Know how exactly shutter speed, metering, and aperture works! It seems obvious, but trust me, shooting in film is so different with digital. You ought to know how to properly use camera to be able to shoot with it. Think twice, shoot once. Always. 7. Be bold and experiment! Photography is art not science, so just go out and take some shoot! Film photography is really exciting because you take more control in your shoots, but at the same time, it can surprise you when you see the results. Try different range of films and see what you like the most. It will come with a lot of trials and errors, but I guaranteed you, it's really worth it. So that's it! Thanks for reading. Hope this post inspired you to go analog. I know that film is expensive, and it's not for everybody. It's not convenient, obviously. But film helps me to slow down and really think on my composition, so in some ways, I think it is more relaxing and educating than my pro digital camera. There is just great feelings I can't explain when seeing those film rolls after it gets developed. Something about nostalgia I guess. See you in next post to see my first roll results.